Give Back Yoga is pleased to introduce the newest member of our talented Advisory Board: Anand Mehrotra, founder and Master Teacher of Sattva Yoga. Born and raised in Rishikesh, the birthplace of yoga, Anand combines the ancient wisdom of his upbringing with a lighthearted rebelliousness to bring Sattva Yoga to modern audiences in both the East and West. Sattva Yoga is a holistic, ever-evolving practice that combines asana, pranayama, meditation, kriya, and wisdom, inspiring students to experience freedom, radical aliveness and their most authentic Selves. Anand was featured in the award-winning documentary The Highest Pass, which will soon be followed by the docu-TV series The Four Sacred Peaks. He also recently released an online course entitled Himalayan Wisdom for a Life Beyond Fear. Anand is the founder of the Khushi Foundation, which provides medical, educational and spiritual support to the children of Rishikesh; and the Sattva Foundation, which benefits the elderly. During a recent visit to Boulder, Anand shared these words of wisdom on service and our practice of yoga with Give Back Yoga’s Executive Director, Rob Schware. 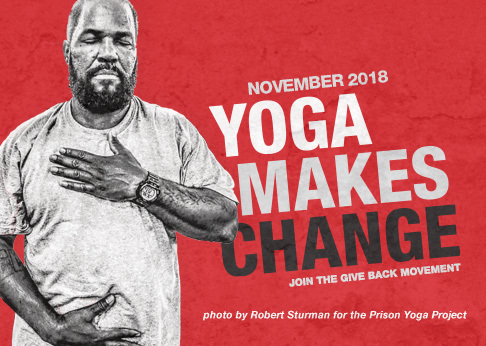 Rob: What changes occur during our asana, pranayama, or meditation practice that helps us to get off our mats and “give back” to our communities the benefits we have received through the practice of yoga? Anand: The word yoga in asana, pranayama, and meditation (the 8 limbs) means “wholeness.” The purpose is unity, and coming to wholeness is the entire basis and inspiration of our practice. Without it, we live a fragmented life, because our senses become confused, and this confusion creates conflict in our inner life. The invitation of yoga is to return to wholeness, and what can awaken in us is love, wisdom, kindness, and compassion. A life without service cannot be a full life, and we may live a narcissistic life full of aversion, self-hatred, and self-projection. The practice of yoga is an invitation to surrender to our body and breath, and discover the truth of who we are. When we are on the way to becoming whole, we can serve. Rob: How can you serve without attachment to the outcome? Anand: Even in our service, we are looking for validation. We must be vigilant about our ego interfering with our heart, and surrender to the great mystery. Our soul is beyond suffering and there is something far greater than our ideas at work in our lives. Continuity is the key to service. Continuity of awareness is liberation itself. Disappointment and agitation comes from the ego. It is understandable to look for validation even in our service; this is our ego speaking. We must try to resist the force of our ego interfering with our heart’s desire to serve. Even as we suffer, we can find solace in our steady commitment to yoga in service to others. Rob: How do you deal with “compassion fatigue”? Anand: On a practical level, people who practice yoga want to make a difference. We are a “team” of people connecting in community. Fatigue sets in when we get stuck on sympathy. My approach to service is with a deep sense of humility, to want to share and serve. Rob: How do you model leadership when working with unserved populations? Anand: I believe we are all leaders. Yoga teaches, “Thou art supreme; I am totality.” We lead by our examples so kids may find inspiration by how we live–in the same consciousness and the same light. A true leader will always lead you to you. Rob: What are some of your ideas about, or hopes for, the future of “service yoga” in America? Anand: America is a free nation, yet so many people are hurting–a paradox. Yoga plays the role of healing and gives people tools. Americans have so much, yet the anger and rage amongst teenagers surprises me. You look at kids in emerging countries and they have such an innocence, often living without anything or with very few material possessions. Our kids shape our future and Americans need to wake up to a sense of community and bonding, which increases a sense of self, where their neediness and judgment drops. America shapes the global world with its messages and trends, and it is high time to wake up and use these tools to create a positive impact. Thanks to Alice Trembour and Sasha B. Cohen for editing and transcribing this interview. Yael Calhoun on Working With Veterans: "I Can Feel Myself Breathe"